07.14.07 If you haven't had the opportunity to play in one of these delightful tournaments make July your month to do it! Well-run and organized, the Washington County Chess Federation's monthly Swisses have become a standard on Maine's tournament calendar. July's event will take place on Saturday, July 21st in Lubec, the polpular Maine summer vacation destination. Come out, play some chess and enjoy downeast Maine! 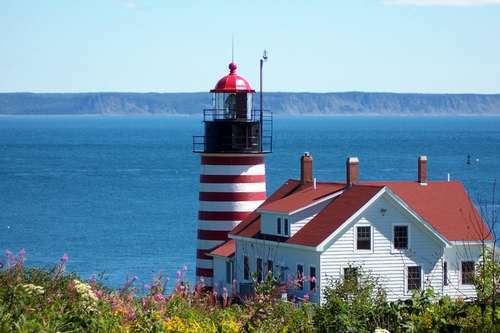 West Quoddy Head Light, the *easternmost point in the United States, is located in Lubec, Maine. Strange that the easternmost point is called West Quoddy Head? That's because East Quoddy Head is on Campobello Island in New Brunswick, Canada. *Purists may scoff because technically, the westernmost point in the US ’Äî Peaked Island, offshore from Cape Wrangell, Attu Island, Alaska (172¬ƒ26'E) is also the easternmost point, as it falls on the other side of the 180 degree international date line.